What is Deinterlace? Why We Need to Deinterlace Video? Deinterlacing video is the process of converting an interlaced video to a progressive one. HandBrake has a built-in option to deinterlace video. You will find that there's good reason for deinterlacing videos, after figuring out what is interlaced video and what is progressive video. Videos sources that are listed with the letter i are called interlaced, such as 1080i. 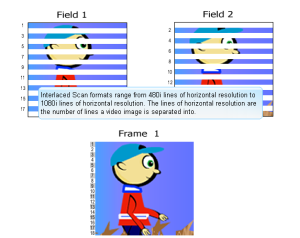 Interlaced video is a technique for doubling the perceived frame rate of a video display without consuming extra bandwidth. The interlaced signal contains two fields of a video frame captured at two different times. This enhances motion perception to the viewer, and reduces flicker by taking advantage of the phi phenomenon. However, only a display natively capable of showing the individual fields in a sequential order can display interlaced videos properly, such as CRT display and ALiS plasma display. Video sources that are listed with the letter p are named progressive videos, such as 1080p. Different from interlaced video displaying even and odd scan lines as separate fields, progressive video displays both the even and odd scan lines at the same time. Therefore, progressive video will be smoother and more realistic than interlaced video. You won't see interlace artifacts and blurry images. So, why not deinterlace video? HandBrake, a free open-source tool, can do this job for you. Or, try the following HandBrake alternatives to deinterlace video in an easier way. • Rip and deinterlace video on old DVDs, latest copy-protected DVDs from Disney and others, workout DVDs, home-made DVDs, and almost all you have. • No confusing options. No quality loss. • 100% clean without malicious software. • Deinterlace 4K/HD/SD video in nearly any format, such as MP4, AVI, MOV, MKV, HEVC, MTS, AVCHD, MPEG2, WMV, VOB, FLV, 3GP, MOD, etc. How to Deinterlace Video with HandBrake? HandBrake is a desktop-based video transcoder with Deinterlace option. If you haven't downloaded and installed it, please hop over to HandBrake download page first. Then, follow the guide below to deinterlace your DVD or video with HandBrake. Step 1. Open HandBrake and the source DVD or digital video you need to deinterlace. Step 2. At Destination part, specify the destination path to store deinterlaced video and the name of it. Step 3. Define output container (MP4 or MKV). You can also choose a preset from the right column, or create a new profile based on your own needs. Step 4. Click Filters tab, move to Deinterlace, and then choose desired deinterlace settings from the drop down lists. There're quite a lot of confusing options to choose. Many HandBrake users are still overwhelmed, although HandBrake has displayed simple explanations about Yadif, Decomb, and Interlace Detection. • Yadif is a popular and fast deinterlacer. • Decomb switchs between multiple interpolation algorithms for speed and quality. • Interlace Detection, when enabled, allows the Deinterlace filter to only process interlaced video frames. Step 5. Click Start Encode button to deinterlace video with HandBrake right now. We have to admit that HandBrake Deinterlace feature isn't suitable for beginners. It's difficult for them to completely understand each filter, let alone choosing a proper one. 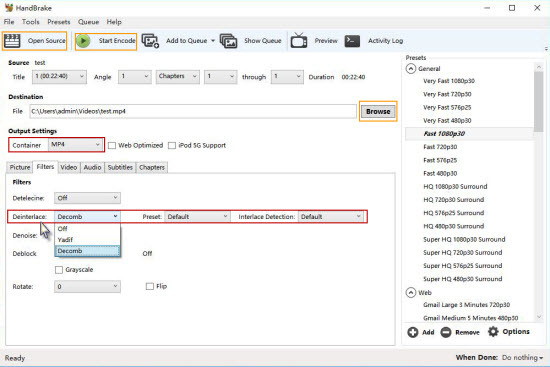 Therefore, we will often see posts about HandBrake deinterlace online, such as what would be the best settings to deinterlace video on HandBrake, what's the difference between Yadif and Decomb, HandBrake deinterlaces video slowly, quality is damaged after deinterlacing with HandBrake, etc. Digiarty Software, a leading multimedia software company with over 10-year experience, provides the best HandBrake alternatives empowering users to deinterlace videos in an easier way. To rip DVD and meanwhile deinterlace video on DVD, WinX DVD Ripper Platinum is the way to go. To deinterlace digital video, simply try WinX HD Video Converter Deluxe. And the steps to process deinterlacing are almost the same: load source file -> choose output profile -> check "Deinterlacing" -> click RUN to begin deinterlacing. Take WinX DVD Ripper Platinum as an example. After downloading and installing in on your computer, you will rip your interlaced video on DVD to progressive video within several mouse clicks. Step 1. Click DVD Disc button to load source DVD into this HandBrake alternative. Different than HandBrake only supporting unencrypted DVDs, it allows you to load almost all of your discs (including old DVDs, latest Disney 99-title DVDs, workout DVDs, etc.). Moreover, it normally detects the correct main title automatically. Step 2. Choose a desired output profile from the 350+ options, far exceeding the presets of HandBrake. Step 3. Check Deinterlacing. There're no other options to confuse you. After that, you can also enable or disable other options like Safe Mode and Use High Quality Engine, click scissor-like icon to crop video, trim video, etc, based on your own needs. Step 4. Click RUN button to start ripping DVD and also deinterlacing video. Thanks to the support for the Multi-core CPU use, hardware encoder, Super Encode Engine based on MMX- SSE & 3DNow! and Hyper-threading tech, the process will be completed at the world's No.1 fast speed, sporting DVD to MP4 conversion possibly being done within 5 minutes. Can libdvdcss Help macOS Sierra Rip All DVDs along with HandBrake? Can't Download and Install libdvdcss on Mac OS X El Capitan? How to Fix?